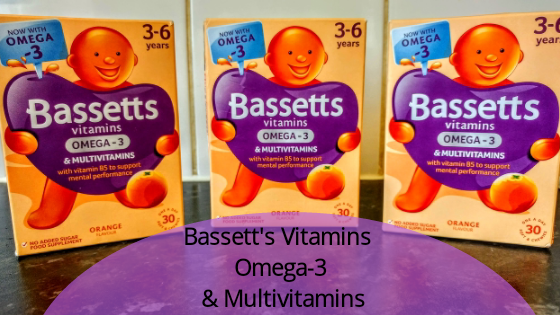 Bassetts Vitamins Omega-3 + Multivitamins Orange Flavour Pastilles for 3-6 years come in a juicy orange flavour. We were kindly sent some samples to see what we thought about the multivitamins. These Bassetts Vitamins are tasty, soft and chewy multivitamins. With no added sugar, natural flavours & colours, Bassetts Vitamins Omega-3 + Multivitamins Orange Flavour Pastilles contain some of the necessary nutrients to help support the health of three to six year olds. With children starting nursery or school around these ages it gives you peace of mind knowing your child is getting some of the essential vitamins each day. Bassetts Vitamins Omega-3 + Multivitamins Orange Flavour Pastilles contain Vitamin B6 to support normal psychological function and Vitamin B5 which contributes to mental performance to support a smart way to start the day. Izzy thought the chewy multivitamin was juicy and delicious! She said it reminded her of trying the juiciest orange she ever had. She thought it was so juicy she could just squeeze all the juice out of it to make orange juice and drew this picture of the ‘juiciest orange ever!’. It’s definitely a thumbs up from Izzy.